According to ancient mythology, the Celtic culture originated somewhere around the year 200 BC. Strong and powerful, the Celtic warriors defeated many large adversaries, including overcoming the Roman army in 385 BC. 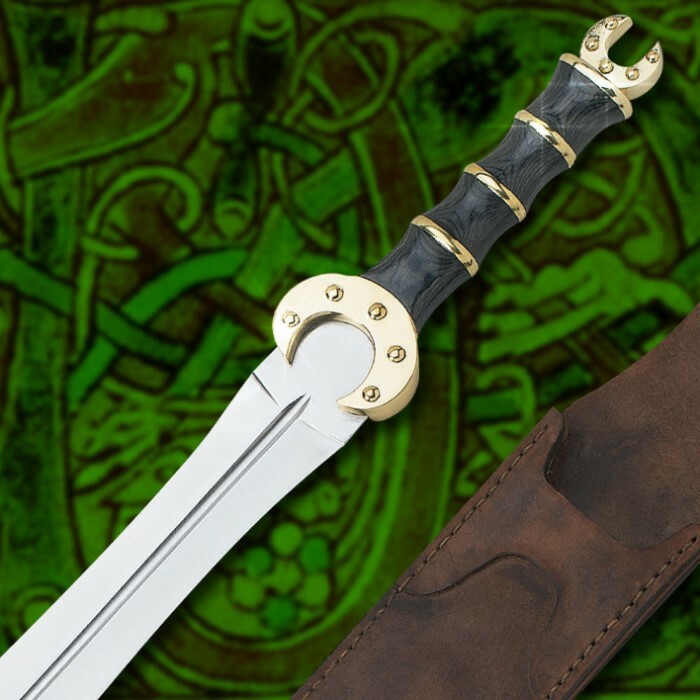 In concordance with the Celtic attire, we are proud to offer this new war dagger. Featuring a double edged, 19" blade constructed from mirror polished stainless steel. The hardwood handle is accented with brass plated spacers and the symbolic crescent tang guard and pommel. 26 1/2" overall. Includes a top quality leather sheath. The blade has a overall twist in it, not bent left or right, just twisted. The rivets on the handle are a little crude, but in a way, they give it an authentic, used, look. Bottom line: I'm glad I purchased this. 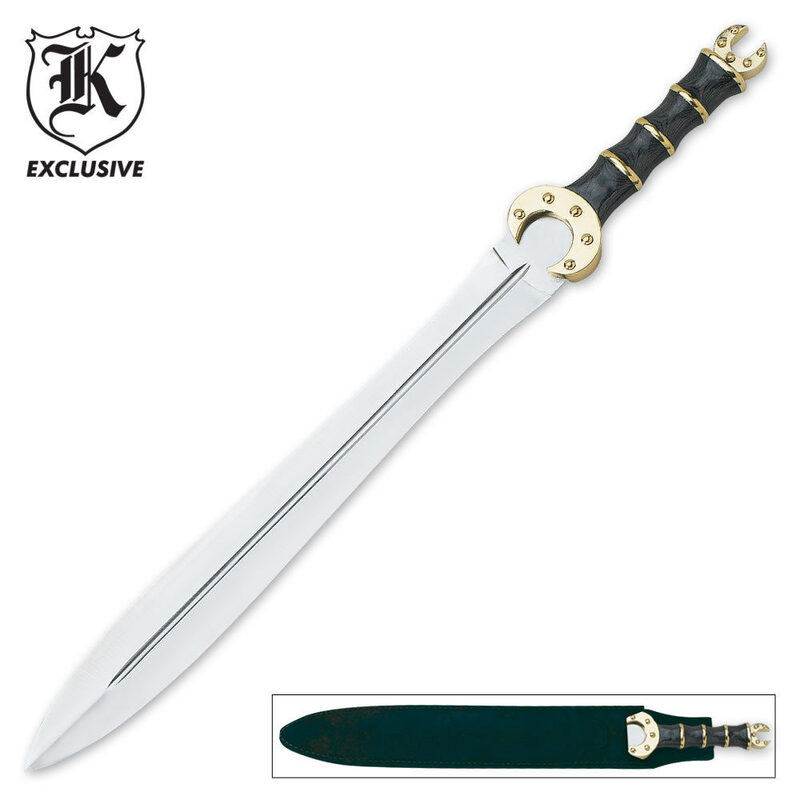 I bought this for a short sword to go with my ensemble for the ren-faire and it seems perfectly suited for that purpose. The only drawbacks on this piece that I can find is that the edges are totally flat and 'PAKISTAN' is boldly stamped on the blade, but I believe I can remedy those shortcomings. The scabbard needs to be doctored up a bit as well but is not hopeless. I've given this sword a few swings and nothing rattles or shakes, it is pretty solid but definitely not a battle ready weapon. If you are looking for a display or accent piece, this is it. This sword fits the traditional Celtic dress sword perfectly. And it is not dull it is exactly as sharp as a sword of its weight should be. Very powerful. Nice weight and feel, a few scratches on the sword but overall a nice sword. The blade itself is beautifully finished but the brass corrodes fairly quickly. Its a great addition to my collection, but I wouldn't recommend it as anything other than decoration. The edges are machined and its not possible to sharpen it without damaging the finish. Its still a very nice sword and a great addition for anyone. This sword is good and worth the money my complaints would be the handle came slightly warped[barley noticeable] good size good weight and to my surprise a good edge an excellent sword. The tip of the blade is slightly bent to the one side. Some of the beads on the handle are placed unevenly. Also note that the handle is wooden (It doesn't look wooden in the photo) and very heavy. So other than these things... It is a great buy. It's an alright sword, definetly not the best in my collection. The hilt guard had a loose bolt and the hilt itself was coated in grit. Its worth the price but its definitively a fixer upper. The shortsword as a whole is impressive. although MY guard came very slightly crooked, it was not enough to affect the sword's performance in any way. The sword itself is a bit blade-heavy, but This is how these Celtic swords were made at the time. upon closer inspection of the blade, i was pleasantly surprised to see that the sword seemed to be Battle-sharpened, that is, Sharpened enough to cut well but not enough to make the edge thin or fragile. were it not for the shine of the blade, the engravement that read "pakistan", and the fresh smell of leather that i love so much on the sheath, i would have thought that this blade actually came from Medieval Ireland.